Form connections to build your network, engage, and make the biggest impact in observing, celebrating, and protecting our waterways. In Water Reporter, people form connections by joining organizations, sharing reports, and commenting through report threads. Whether you are keeping track of your favorite places to paddle, helping engaged community members tackle a stream cleanup, or identifying algal blooms for a citizen science campaign, Water Reporter makes it seamless for everyone to stay connected via one easy to use platform. Turn on notifications and you will always be kept in the loop when someone comments or takes action on a report via automated email notifications. From your profile, tap on the gear and scroll down to where you see three switches. When turned on, Water Reporter will send you email notifications anytime an individual interacts with your report. This could mean someone comments on, likes, or resolves your report. Comments are a great way to start the conversation around a specific report of interest. 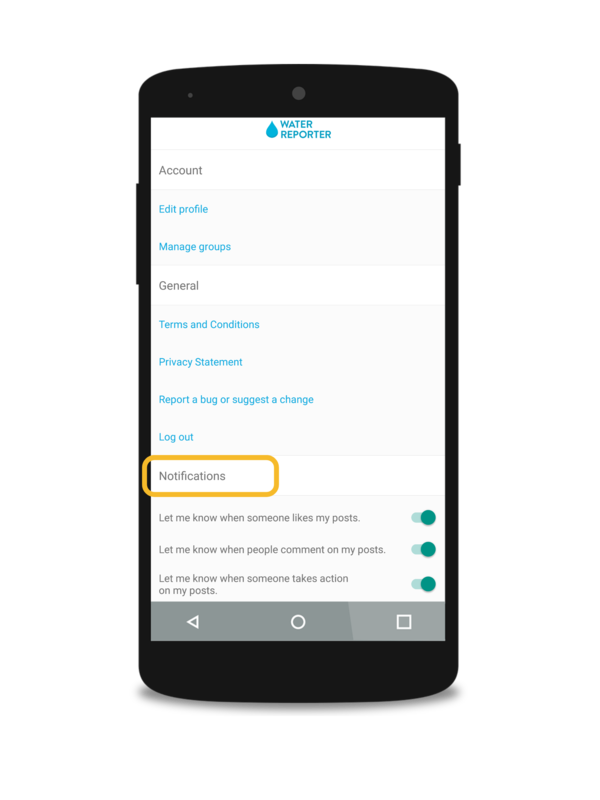 Comment on any report by tapping on the comment bubble of open reports or blue badge where actions have been taken. Write in comments or add a photo by tapping on the photo icon to attach a photo to the comment. If others in the thread have their notifications turned on, they'll receive an email letting them know you’ve added your ten cents to the report thread. Don't have anything specific to say? That's OK! You can show your interest in a photo simply by clicking the heart. Check out who else liked a report by opening the report and clicking on the likes. Fun Fact - the interface of the Android and iPhone apps are slightly different because we build native apps for each platform. So if Water Reporter looks slightly different on your device than it does in the help docs - don't sweat it! Both platforms work more or less the same and help keep an eye on the health of your environment.